"If my words did glow, with the gold of sunshine ..." I have a confession to make, and I want you all to Hear it. I love music. In so many ways, it has formed and informed my life. I owe it so much. Why not write about it? Lakewood Amphitheater in Atlanta, Georgia is the Wrigley Field of music in the South. Outdated, painted-over, dilapidated, and unfortunately located, it's home field charm shines through its rust. Ask a Southern music lover where "the Lawn" is. You'll get a knowing smile and an immediate "Lakewood. [Insert some variant of 'I've had some killer times at that place!']." It's hard to explain how or why it has survived. It's difficult to get to; getting home is even worse. The neighborhood can be scary. The lots are unsavory barely-maintained urban asphalt and gravel-dirt with no facilities and indicia of squatting everywhere. Tailgating friends can be a 30 minute urban adventure away with poor coordination. And what's with that old stadium? But on just the right midsummer night, when the obligatory afternoon micro storm had passed and the heat started to seep out of the concrete as the sun set, a stirring Vibe took over. For me, there's significant personal history there. It was the site of my very first concert (a Pantera/Sepultura/Prong triple bill in '94; the '80's era Poison and Bon Jovi shows at Albany Civic Center were a non-starter in the Johnson household) and some of the best I've ever seen (where to start: Phil Lesh Quintet 8/5/01, Phish 6/23/00, Radiohead 5/8/08). 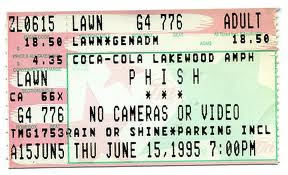 When Phish hit town back in the early '00's, typically around July 4, you could smell the electricity around the place. Tickets sold out the day they went on sale (waiting in line at the Publix in Buckhead on a Saturday morning was the only chance you had) and were impossible to come by. With every type of handmade good being offered by every type of person imaginable, for half a day, it was an island unto itself; the closest analog that children of the '70's and '80's will have to a prime era 'Dead experience. The memory of weaving through the glow stick wasteland peppering the standing, laying, spinning, spun-out, and jumping bodies on the Lawn is eternal. As bad as you wanted to find Your Spot and unload a couple of the beers you carried through the melee for your journey friends, the journey was strangely pleasurable. It was like stumbling through a cloud of bliss, a momentary oasis of unadulterated joy that would only dissipate when the sun rose again. I'm heading back to Lakewood tomorrow for the first time in years. The Bob Dylan Americana Music Festival awaits. We will see whether the nostalgia masks the grand old venue's deficiencies to more discerning (i.e., aged) eyes. The place will be different to me now, but that's quite OK. The Ghosts of those magical nights in the '00's live on in my head.